Other helmets might be more readily recognizable as Roman thanks to media portrayals, but this Montefortino A Helmet is actually based on a design that was used and favored first by the Celts and then the Roman legions for quite some time. 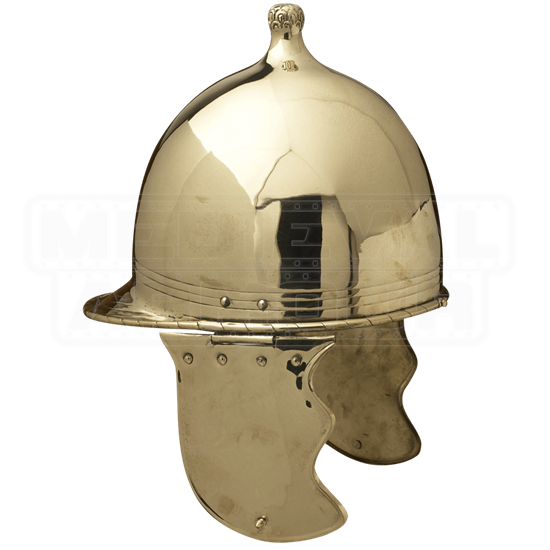 This helmet is a newly revised design that conforms closely to the original montefortino helmet, featuring a rounded cap that works wonders for diverting blows away from the skull, as well as a short knob on top that functions as both a defensive measure and a simple decoration. Hinged cheek guards are also incorporated into the helmets design, providing additional protection to the face while leaving the wearers eyes and nose completely uncovered. The helmet is made from quality brass metals and features a polished finish that is quite the sight to behold. While it might not be the typical Roman helm that the public at large would recognize, this Montefortino A Helmet is a classic Roman-era helmet that would have been favored by and successfully used by the legions for hundreds of years. Caesars own legions would have likely worn this helmet, and that makes it a great historical piece that is as functional as it is collectible.